If you seek true public engagement in a planning effort, Cedar Creek Planning & Communications deploys a variety of tools – from pounding the pavement to stakeholder processes to sophisticated digital tools. Surveys. With a premium Survey Monkey account, Cedar Creek has designed surveys, gleaned opinions from hundreds of respondents, and sliced and diced the analyses to provide a clear picture of what a community is thinking and envisioning. Project websites. Cedar Creek can quickly design and launch a website for the duration of a project that includes relevant information, a calendar, opportunities for the public to weigh in, photos and video, interviews, survey results and links to related social media such as Facebook and Twitter. 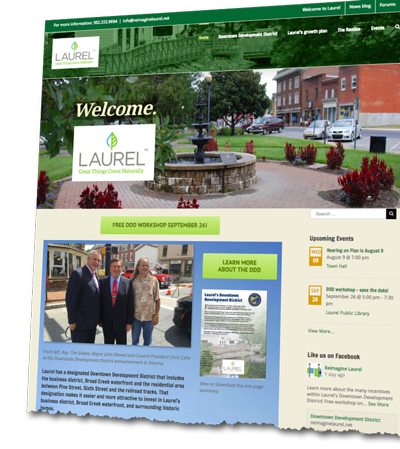 One such website is Reimagine Laurel, developed to convey information about the town’s Downtown Development District application, comprehensive plan update, The Ramble redevelopment plan, and other initiatives. Community Heart and Soul. Cedar Creek has adapted the Orton Foundation’s Community Heart and Soul approach to empowering citizens and other stakeholders to help shape their communities’ future. This well documented and resourced approach was used to help develop the guiding principles for Laurel’s comprehensive plan. Video storytelling. In line with the Community Heart and Soul approach, Cedar Creek often uses video to help tell the story of a community and the aspirations of its residents. Presentation. Cedar Creek uses these tools and more to go well beyond the limitations of PowerPoint to present findings and recommendations in a compelling, jargon-free way. This presentation, “What Does Laurel Have the Will to Be?” defined the tough issues for Laurel’s comprehensive plan. Charrettes. Lee Ann Walling is certified in the National Charrette Institute’s system for solving complex planning and community issues through intense collaboration. This method requires a commitment of 3 to 5 days from stakeholders, as well as extensive pre-planning.